This application is a first person shooter game in which the user has to shoot in order to invade aliens. The best thing is that there are a lot of weapons and upgrades available with multiple campaigns. And also unlockable achievements which will provide unlimited entertainment. This app is a kind of role playing game and is developed by Gameloft which is reputed to create best iPhone and Android Games in the market. This game has 3D graphics, perfect game-play mechanics and controls which makes it an indispensable asset in gaming on this platform. This game has a cost of $4.99 and it is worth it. This is another RPG game application which is from DvideArts and is the first of its kind on Android. This game has slightly older forms of graphics and it has multiple quests to be completed which will unlock further achievements. The user will actually find himself indulged in fighting, exploring, getting items and also gaining experience. In terms of touch screen the controls are excellent and also feel much natural which makes it a must have game. This game shares its similarity with the very famous Tron movie and also the graphics are stupendous. In this game the user controls himself and races in some very fast light cycles in a stranger way. It is certainly known that Need For Speed is the best racing simulation game which after making huge raves in desktop computers has finally found a way in the Android devices. The NFS Shift has surely got some excellent graphics with lots of cars, tracks with excellent music and also fabulous controls. 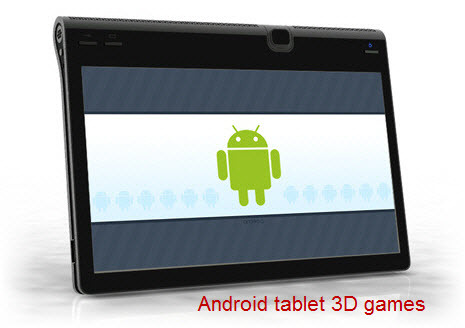 All these features surely make it a must have game on Android tablet. What 3D games you play on your Android tablet? Share your views through comments section.